What is Reference Data Architecture? So what is RDA (Reference Data Architecture)? The information systems focus of GlencoIS is Reference-Data-based interoperability and implied architectural requirements for full life-cycle solutions. Quite simply, whatever business and technologies, and however these evolve, there are dependencies on how shared information is referenced and linked. Why should I care about Reference Data? direct cost-and-time-savings in reducing effort in transferring, mapping and in simply finding & accessing information necessary to do your business. risk-and-cost-reductions in the quality and ambiguity of information which otherwise lead to sub-optimal business operations, failure to satisfy regulators or, in the worst case, loss of health, safety & environmental integrity. freedom to take advantage of new opportunities in collaborative business processes, flexible business partnering, and different subcontracting arrangements across your evolving, remotely distributed, business operations and supply-chains. Different businesses domains already address different parts of this problem with varying degrees of success. What is clear is that drivers for information & communications technology standardization are much broader than your own business. And it is also clear is that software solutions & services have quite different supply-chain development and support life-cycles compared to your core business. … must be standardized independently wherever possible, if the benefits are to be realized. This is the key architectural requirement – whatever the technology. ISO15926 is a standard built on this architecture, focussing on standardization of information (models and semantics) independent of particular business applications and usage, and neutral with respect to implementation technologies. It is far from being the only industrial standard that recognizes such a focus on the standardization of information in data dictionaries or reference catalogues. Counter-intuitively, details of the information ontologies and libraries standardised are much less significant than the overall architecture implied. How reference data is used is much more important than exactly which reference data is standardised. So, a key feature of ISO15926 is that shared information definitions are handled as Reference Data; reference data that is itself accessed and managed independently of your business information and its implementations, and indeed independently of the many possible standards and catalogues that may define that information. as well as between different businesses & technologies. Because the business scope of such wide interoperability is very large, it is impractical to expect the critical operations of any major business, let alone whole industries, to rely on a single reference data service provider for life. 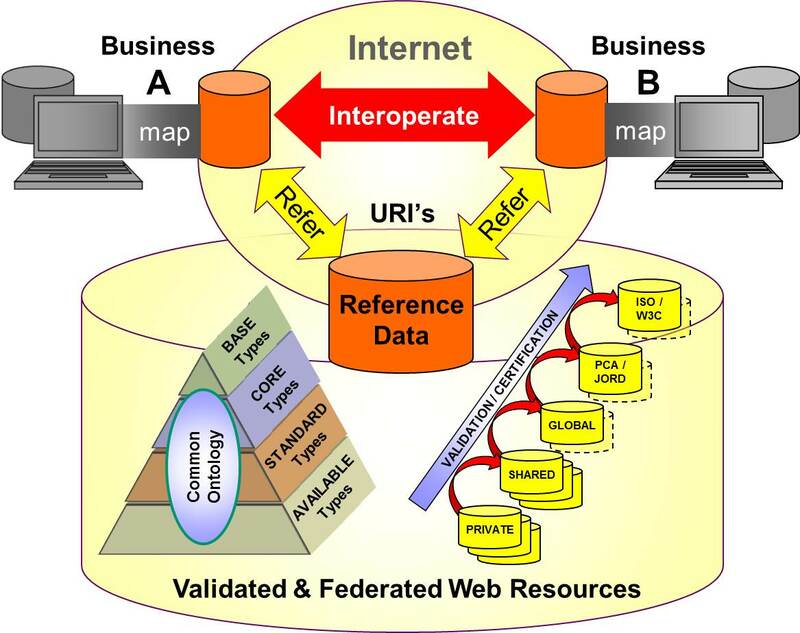 A key feature of the ISO15926 RDS architecture is that it also supports multiple federated reference data systems and operations because, being entirely technology neutral it can also exploit the most standard “semantic web” implementation technologies without imposing any dependency. The reference data available to any one business is the sum total of a whole web of linked resources. And, because the way those linked information resources are represented is itself standardized, they benefit from sharing a common scheme for their quality and compliance validation. What does it take to exploit Reference Data practically? The business benefits and attraction of succeeding in adopting the ISO15926 Reference Data-based Architecture for interoperability ought to be intuitively obvious given the description above. But the huge scale and complexity would lead anyone to be wary of seeing it as a single viable implementation project or business. A metaphorical elephant. No-one should try to eat a whole one. ISO15926 Reference Data has been a series of collaborative projects since 1991. From 2011 to 2013 the Joint Operational Reference Data (JORD) project was a collaboration facilitated jointly by PCA (POSC Caesar Association) and FIATECH to establish a core set of services, methods and capabilities. This core enables the evolution, management and validation of compliant use of reference data not only by your business directly, but by a federated web of competitive providers of value-added content, systems and services to your business. These developments continue today in initiatives like USPI(CFIHOS) and PCA(MRAIL), open to members and non-members alike anyone – who recognises that their adoption of ISO15926 to achieve interoperability depends on shared reference data.